At first glance, checks can seem intimidating, especially because they don't come with instructions and they do involve money. 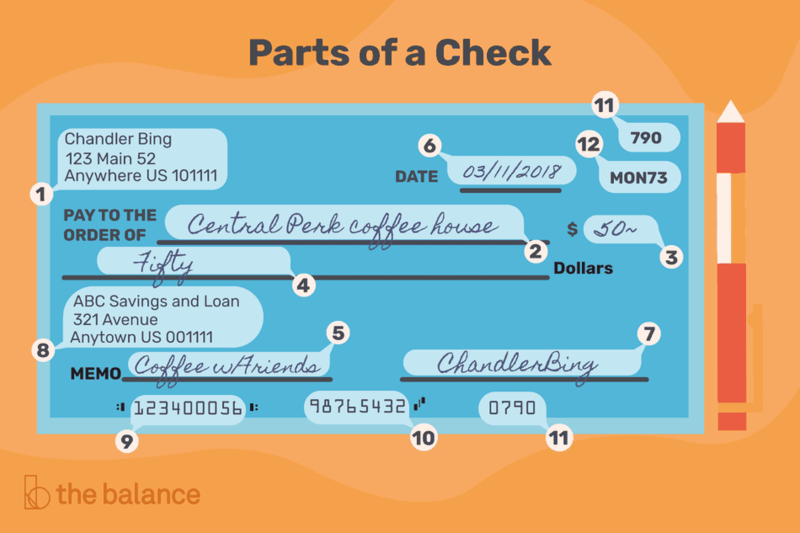 Once you understand the different parts of a check, you’ll be able to understand the different check components and complete a paper check quickly and properly. For each of the blue numbers in the image above, you'll find a short description. Scroll down for more details on each section of the check (as well as hints for filling out or reading that section). What about the back of a check? You may also need to view or endorse the other side. Understanding your checks helps you order new checks and make sure the order comes out correctly, write checks, and set up direct deposit instructions. If somebody writes you a check, you can also verify that the check was filled out properly so there won’t be a delay in getting your money. The upper-left corner typically shows personal identifying information about you, and it is almost always pre-printed on checks. Some merchants won't accept your checks without pre-printed personal information. Your name is the most important part, and you might also include contact information in this space. When you open a new account, your bank might give you a book of temporary checks with a blank spot for you to hand-write your personal information, until your regular checks arrive. If you're concerned about privacy, you can limit the amount of information on your checks. Use a Post Office box instead of your home address, for example. However, it's not uncommon for retailers to require certain details to accept a check. They may write your phone number on the check in pen, for example. In this section, you specify who will receive funds from your checking account. Write the name of the person or organization that you wish to pay, also known as the payee. Only the named payee is allowed to negotiate the check by depositing it, cashing it, or endorsing it to someone else so that person can deposit it. If you don't want to name a specific person or organization, it is possible to pay your check to the order of "Cash." However, this is risky because anybody can cash the check, not just your intended payee. Write the amount of your check in numerical format (using numbers, as opposed to writing out the amount with words) in the dollar box. This box is sometimes called the "courtesy box" because it appears on the check as a courtesy or convenience. The number in this box is not used to determine the legal amount of your check. Instead, the official amount comes from the line below, preceding the word "DOLLARS." In theory, both amounts should match, but sometimes they don't. In those cases, the written words take precedence over the numbers in the dollar box. For security, when writing a check it's best to put the numbers in the dollar box as far to the left as possible. This prevents somebody from altering the check and inserting another number before the number you entered. You should also clearly enter a decimal, and any numbers after the decimal (even if it's "00"). On this line, write the amount of your check using words (as opposed to using numerals). For example, if you write a check for $10.50, enter the following on this line: "Ten and 50/100." Note the fraction in the example above. Whenever there's an amount less than a full dollar (fifty cents in this case), write it as a fraction. Since there are 100 cents in every dollar, you can just put the number of cents above the number 100. For more explanation and examples, read about putting dollars and cents into words. Writing out the amount with words reduces confusion and helps to avoid fraud. It's harder for somebody to alter the check if you've done this. They can tamper with the numbers in the Dollar Box, but they'll have a hard time altering this line. The amount written out with words is the official amount of the check. If there's any difference between the dollar box and the amount what you write here, the bank is supposed to ignore the dollar box, but that only happens when somebody notices the difference. The memo line can be used to write an unofficial note on your check. Sometimes it's nice to know more about a check, such as what the money was for, which particular account it's for, and so on. The official parts of a check only handle specific details, such as the payee and amount. If you want more information, the memo line is for anything else you'd like to write on the check, such as your purpose for writing it. You'll receive either the actual check or a copy back for your records, so the memo field works as a good reminder if you look back at your cashed checks later for taxes or other purposes. Memos can be helpful for you, or for your payee. The memo line is a good place to write your account number if you're paying somebody. They might not be able to figure out who you are or which account to deposit in if all they have is your name. You don't necessarily need to get everything on the Memo Line. You can write additional information just about anywhere on the front of a check, but avoid using the back of the check. Especially if you need to provide lengthy account numbers (or Social Security Numbers and tax forms - along with the filing period), you can just find some blank space to write that information. Be careful not to block out anything important, such as your bank account and routing numbers. Enter the date in this space. Note that you can't post-date checks and get away with it, so it's best to enter the current date so that you know when you wrote the check. Writing a future date on your check will not typically prevent the recipient from depositing the check immediately, or the bank from processing it upon receipt. Sign the check at the line on the bottom right-hand corner of the check. Be sure not to sign until you've filled out and reviewed all of the other sections of the check. If you sign an otherwise blank check, somebody can put whatever they want in those empty spaces; they might decide to pay themselves a million dollars. For many of us, that check would bounce, but it's still a bad idea to hand out blank checks. You may find the letters "MP" next to the signature line. It indicates that the check includes a security feature called microprinting and that there are tiny words on your check that cannot be detected by the naked eye. Note that the person who writes the check is the one who signs the front of the check. The recipient will sign on the back to endorse the check. Your bank will have you sign a signature card when setting up your account, so they'll recognize your signature or a forged one if someone else were to steal your checks and sign them. Your bank's name appears on every check so that recipients know who to contact. A phone number and address may be included, or you might just see the bank's logo. Other important information about your bank appears elsewhere on the check. For example, your bank's ABA/routing number is at the bottom of every check, and that number is used for processing the check. If you received a check from somebody, this section tells you where they bank; the money will come out of an account at this bank. If you want to cash the check, you should be able to do it at that bank (any branch location - not necessarily at the same address shown on the check). However, the bank might charge a fee if you're not a customer there, and in some cases, they might even refuse to cash the check. The routing number, found at the bottom left of your check, serves as an "address" for your bank. With that number, other banks can get in touch with your bank and collect funds from your account when you write a check. Routing numbers are written in a specific font with magnetic ink. It allows them to be easily read by computers, which makes check processing faster. Your account number is also located on the bottom of a check. It is printed in a strange looking font that is designed to be easily read by computers. In most cases, there are three numbers at the bottom of a check, and your account number is the one in the middle. However, occasionally you'll find checks that use a different format, so it's a good idea to confirm your account number before trying to use anything that you grab off of a check. For example, business checks and checks created by an online bill payment system have a slightly different format. A good way to find your account number is to look for this symbol: ⑈. Your account number appears just before that symbol. A check number is simply a reference number that helps you keep track of the checks you write. It will help you balance your checkbook, and keep track of which checks have been processed by your bank (and which checks are still outstanding). This number usually appears in two places: in the upper right-hand corner, and on the bottom of the check on the far right. Again, checks may be formatted differently depending on where they are printed. A good tip for finding the check number is to look for the smallest or shortest number - that's often the check number. The American Bankers Association (ABA) number is generally located on the upper right corner of a check. In some cases, the number is elsewhere, but if you're working with a personal check, you should look towards the upper right. You'll see a fraction such as 12-34567/8901, which represents the bank, its location, and the Federal Reserve branch which services the bank. The fractional number contains some of the same information found in the routing number at the bottom of your check. All of the information on a check is important, so make sure that bank tellers, retailers, and check scanners can get the details they need. The payee name, amount in words, account and routing numbers, and signature are absolutely essential. It's okay to cross out your address and provide an updated address if you've recently moved. The least important part of a check, at least as far as the bank's concerned, is the memo area. This space is commonly used for notes to yourself or the payee, but banks don't require memos to process a check. You can write anything you want in the memo area. For example, when making a donation to an animal shelter, you can write something as unofficial as "Because I love cats." In the sample check shown above, the space to the right of your name is also a good place to add information without blocking out anything important.